Spring has sprung and summer right around the corner. 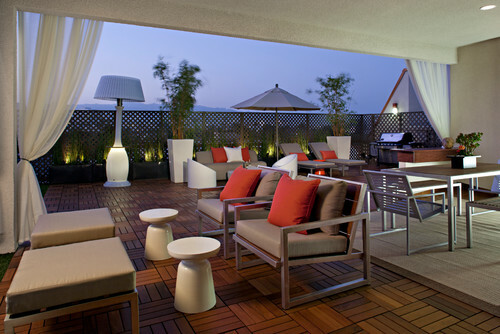 It’s the perfect time to start enjoying beautifully designed outdoor spaces in your modern Atlanta home. We have four ways you can make your outdoor spaces comfortable and inviting. Include some level of covering or enclosure. This allows you to still enjoy an evening meal or cool glass of lemonade during a summer shower. Sliding glass doors set in a modern steel frame makes for a true outdoor room that’s the perfect place to enjoy sunny days and beautiful summer rain. 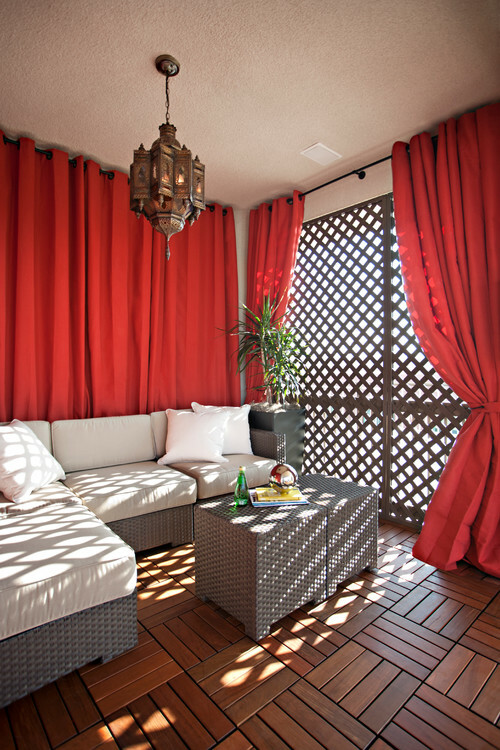 Bold, red curtains make this outdoor seating area feel intimate and allow control how much light comes in. Recessed bench seating in this modern patio area lets you escape the sun when the afternoon starts to heat up. Just like lighting can transform an indoor room, layering different lighting elements in an outdoor space elevates the style and make them more inviting. Recessed lights provide functional lighting while lighting embedded in the planters on the perimeter of this rooftop patio extend the eye outwards and make a showpiece of the greenery. The sconces on this modern deck create a dramatic, vertical effect that’s nicely balanced by lighting along the steps and below the built in bench. 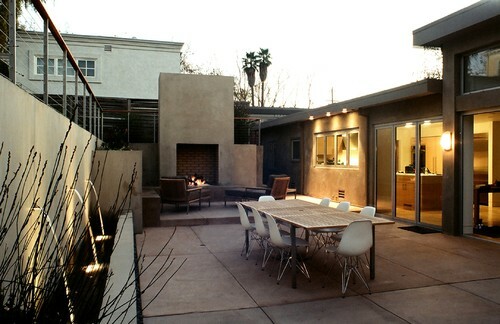 Lights recessed into the modern arbor of this outdoor seating area help further define the space. And a fun and whimsical oversized lamp adds to the “room-like” feel of the space. A contemporary water feature adds beauty and tranquility to outdoor spaces. Flowing water spouts on the garden wall of this London home create a calming soundtrack for evening dinners. 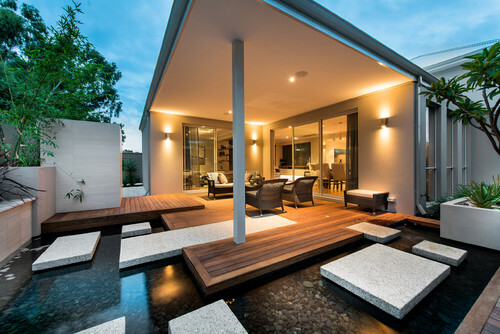 A reflecting pool wrapped around a gorgeous merbau wood deck makes for the perfect zen-like space to unwind. The mixed materials used in this modern water feature are simple but striking at the same time. The juxtaposition of the wood embedded among the hedges is an eye-catching feature. A water feature is an especially great feature for an open-air patio. It adds a refreshing touch on a hot, sunny day. Of course one guaranteed way to make your home’s outdoor space the official summer hangout spot is by designing a modern outdoor theater. Take a refreshing dip or stretch out on a pool chair while watching a classic film. 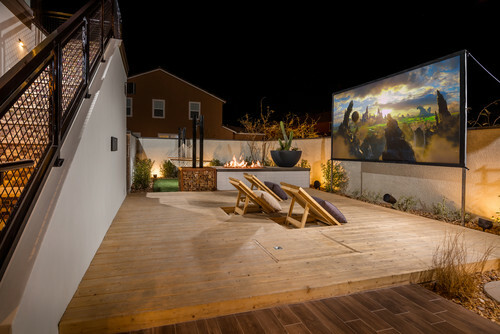 This modern deck features panels that can be raised up and used as seating for your own private movie showings. Simply lower them back down when you need to use the deck space for non-media entertaining. 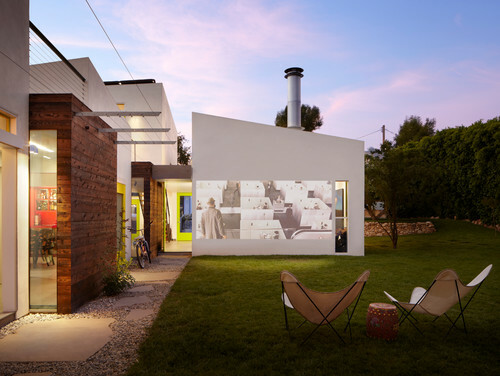 Lastly, this contemporary home utilizes the home’s exterior itself as the movie screen. The effect is simple, clean, and fun. There’s no reason your home should end at the four exterior walls. Make the most of your live-able square footage by partnering with BoldForm Designs on an inviting and useable modern outdoor space. We’d love to hear from you. Interior Design atlanta interior design, modern interior design atlanta, modern outdoor design ideas, modern outdoor spaces, outdoor design ideas. permalink.